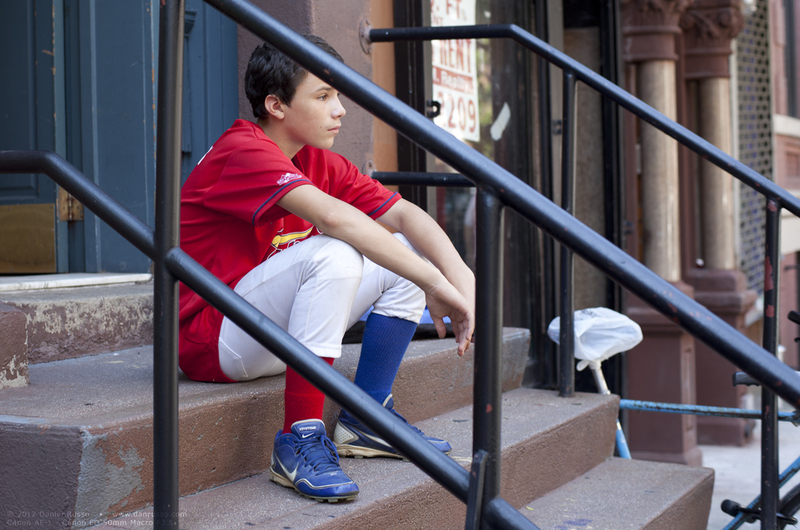 A boy wonders off into space thinking perhaps of his performance in the upcoming or completed baseball game. He sits on his worn stoop, without caring to notice the dozens of people walking across this path. I took this photo while walking in Alphabet City in Manhattan. I initially noticed the boy from about a half block away. I set my camera to monochrome mode, intentionally wanting to shoot in black and white that day. I was shooting an old Canon FD 50mm 3.5f Macro lens. I squatted a bit and peaking under the railing, I found what I was looking for. That face. If there ever a 1000 words to describe it. Some photographers may say the bar is distracting. It's there to frame the photo. The tip of his head, not covered by the bar helps complete the photo. It's a technical trick used in fashion shoots. If a part of a person is covered a bit... lets say a forearm, then allow the upper part and hand show in the shot. This will prevent the part of the body from appearing cut off. Obviously I did not choose to keep this photo in it's intended black and white state. I felt the colors lend a great deal to the overall story of the image.